Every year, on the 2nd of January, “El día de la Toma de Granada” is celebrated in Granada in Spain. On that day in 1492, Muhammad XII of Granada (King Boabdil) surrendered the Emirate of Granada. The Umayyad Caliphate conquered the Iberian Peninsula eight centuries earlier, and the fall of Granada on that day put an end to the Islamic control of that part of the world, or what is known in as Al-Andalus in the Arab world. This year, on the other side of The Mediterranean Sea, some Arabs decided to tweet in remembrance of the fall of Al-Andalus. ‏@taherofficial: We remember the 521st Anniversary of the fall of Al #Andalus. @morabeteen: الأندلس ليست بمكان ولا زمان, بل هي تجربة حضارية إنسانية لا مثيل لها استمرت تنير ظلمات العالم زهاء الثمانية قرون من الزمان..
@morabeteen: Al Andalus is not just a place or chapter in history, it is an unmatched civilization in the history of mankind that kept on illuminating the world for about eight centuries. @mdamra: While London is sinking in mud, Córdoba recorded the 1st dustbin in history, there were collection vehicles and street cleaning! However, a bigger debate started on Twitter later on. Some users believed that this day marks the loss of a part of the Islamic world. @AliElKhateeb: on January 2, 1492, Emir Muhammad surrendered the Emirate of Granada (#Andalus ♥), we won't forget any land taken from Muslims by force. While others replied by saying that it was basically an occupation. 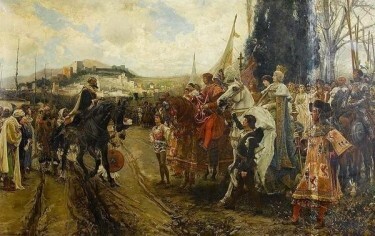 @samaralii: It is called the return of Al-Andalus to the Spanish people after it has been occupied by the Arabs. It is the same as we [Egyptians] reacquired Sinai after it has been occupied. Stop having double standards. @MoudBarthez: Are you sad because you lost Al-Andalus? You wish you had occupied it forever? If so, then the British people should demonstrate to re-occupy Egypt again. @alaa: حكم المسلمون الأندلس سبعة قرون لا يمكن ان يوصف بالاحتلال و لا معنى لتقييم حكمهم بمعايير اليوم اصلا. @alaa: The Arab ruling of Al-Andalus for seven centuries can never be described as occupation. And no way to evaluate it with today's standards. @SherifKhairy: Those who call the Muslim civilization in Al-Andalus occupation, and compare it to the English occupation of Egypt, for sure never read a word about that phase of history. One netizen created a mobile application to mark the occasion, while two others decided to make fun of the whole debate. The first was worried [Ar] that FC Barcelona might become as bad as the the Egyptian football teams if Arabs decided to occupy Al-Andalus again. While the other, after looking at the status of the Arab world today, decided that “we did them the biggest favour ever” by leaving them alone. Finally, this debate didn't stop some Egyptians from arranging a demonstration carrying banners that read in Spanish, “No hemos olvidado” [We have not forgotten] and “Volvera por supuesto” [We will be back for sure”].